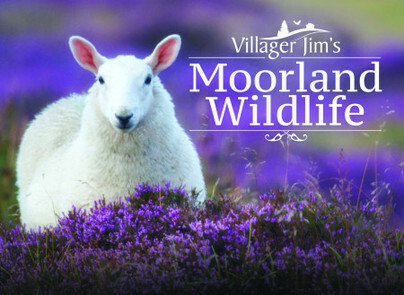 You'll be £19.99 closer to your next £10.00 credit when you purchase Villager Jim's Moorland Wildlife. What's this? Villager Jim, the famous Peak District photographer, takes us on a journey to his very favourite places on the moors surrounding the Peak District National Park, where he lives. From wonderful wild deer to breathtaking buzzards and other birds of prey, Jim allows us a glimpse of his daily moorland travels with all the abundant wildlife that lives in that part of the world. Jim often concedes that it is his most favourite place on earth, being out alone with his camera within this unforgiving landscape, watching the sun rise on the horizon, whilst at the same time, seeing stags wander, grazing on the moorland. It is here also that many of his favourite birds of prey abound. And, of course, he is there to capture the beautiful landscape shots rolling in mists or washed in the golden light of dawn. A beautiful book to simply browse through, each captioned full color photographic image is a visual gem and will have immense appeal to wildlife enthusiasts everywhere. A precious book with no other aspirations than to gather in it a splendid collection of wild animal photographs for our personal enjoyment. ★★★★★ Villager Jim, the famous Peak District photographer, takes us on a journey to his very favorite places on the moors surrounding the Peak District National Park, where he lives. From wonderful wild deer to breathtaking buzzards and other birds of prey, Jim allows us a glimpse of his daily moorland travels with all the abundant wildlife that lives in that part of the world. Jim often concedes that it is his most favorite place on earth, being out alone with his camera within this unforgiving landscape, watching the sun rise on the horizon, whilst at the same time, seeing stags wander, grazing on the moorland. It is here also that many of his favorite birds of prey abound. And, of course, he is there to capture the beautiful landscape shots rolling in mists or washed in the golden light of dawn. A new book by Villager Jim, our famous Peak District photographer, takes you on a journey to his very favourite places on the moors surrounding the Peak District National Park, where he lives. After a brief introduction, Villager Jim’s Moorland Wildlife is literally a feast of photographs capturing the wildlife from deer to buzzards, not forgetting the farm animals, against a backdrop of meadows and rolling countryside. The pictures are outstanding, capturing animals and birds in familiar and unfamiliar settings across the seasons. Those of the deer and birds are particularly engaging. This book is a delight to the and eyes and shows the abundant and fascinating wildlife on our doorstep and what can be seen and captured with just a little patience. The Moorland book focuses on the animal world out on the Peak District National Park. There is a wide breadth of subjects from pheasants to lambs to hares and deer. The photographs are extremely skillful and very beautiful. Jim labels each photograph with either a short description or a short witty caption. This is the second collection of photographs by Villager Jim published by Pen and Sword - this man has a natural affinity with the natural world that encourages the animals he encounters to "pose" for him and his amazing camera work. A superb look at life in Villager Jim's back yard and surrounding countryside. The photographs are amazing!